Having BB-8 on Star Wars Resistance was a stroke of genius. Not only does it allow fans to have one of the most popular characters from the movies on the show, we know where he is during those movies. BB-8’s presence sort of a becomes a ticking clock because, eventually, he and Poe will head to Jakku and things will get rolling. Literally, in his case! 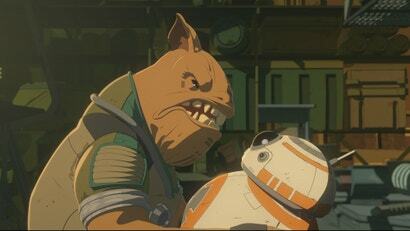 Before that happens though, because it’s animation, there are lots of opportunities for BB-8 to do things he doesn’t in the movies and get into all kinds of mischief. In the latest episode of Resistance, “Dangerous Business,” he was able to do something pretty unique: get into a fistfight. Oh sure, we’ve seen BB-8 mess with people. Knock them down. Hurt them. We’ve even seen him steal an AT-ST. But this week, he got into a full-on, knock-down, drag-out brawl, and it was highly entertaining. It happened after Kaz left BB-8 in charge of Flix and Orka’s store. Kaz goes off to investigate the shady character Teroj Kee, but Kee doubles back on Kaz and breaks into the store hoping to steal the rare and valuable Phase Connector. BB-8 is having none of that though and takes action. BB-8 starts by electrocuting Kee, then hitting him, then evading blaster shots before throwing a fuel canister at his head and dazing him. Then, in what I like to think of as BB-8's finishing move, he latches onto the ceiling and swings like a pendulum to smash into Teroj Kee. Unfortunately, Kee catches BB-8 and though the spherical droid puts up a fight, punching him with his little claws, he’s thrown to the floor and trapped. BB-8 loses the fight, but damned if he didn’t put up a great effort. The sequence lasts all of a few seconds but it brought a smile to my face to see this awesome character really using all his skills to try and protect his friends. BB-8 gets some amazing moments in the movies but this ranks right up there with them. In addition, “Dangerous Business” also had a nice little wink to the trash compactor scene in A New Hope as Kaz, trapped in a crate, begged BB-8 to help him from being dropped in the ocean. A ship actually dropped in the ocean thanks to Kaz, and then another crucial piece of information was leaked in regards to the First Order. Teroj Kee was trying to steal the Phase Connector for them because it’s a piece of tech that’s good for drilling and excavating. Do they want more dedlanite like from Station Theta-Black? Or is this for Starkiller Base? We’ll find out soon. And you thought there were a lot of movies coming out this year? 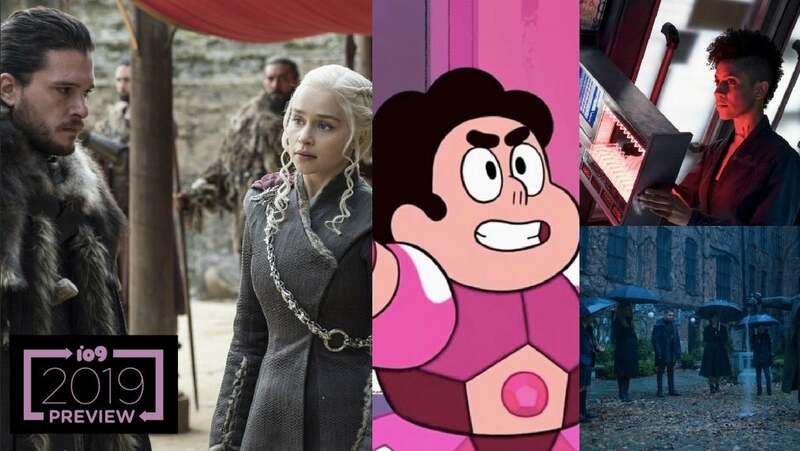 Get ready to never leave your couch in 2019, because the amount of TV you’re going to want to watch is truly staggering. Here’s our mega-giant list of sci-fi, fantasy, and superhero shows we’re most looking forward to, with the standard caveat that any and all air dates are subject to change.